North Korean leader Kim Jong Un vowed to meet the South’s President Moon Jae-in “frequently” next year to discuss denuclearisation of the peninsula in a rare letter sent to Seoul, Moon’s office said Sunday. The leader of the isolated North met with Moon three times this year — twice at the border truce village of Panmunjom and once in the North’s capital Pyongyang — as a reconciliatory push gathered pace. During Moon’s visit to Pyongyang in September, Kim promised to pay a return visit to the South’s capital Seoul “at the earliest date,” sparking speculation he may visit by the end of this year. But the much-anticipated trip has not yet materialised, which left the young ruler feeling “much regret,” according to Kim’s letter sent to mark the end of the year, Moon’s spokesman said. The North’s leader “expressed a strong determination to visit Seoul while watching the future situation,” Kim Eui-kyeom told reporters. 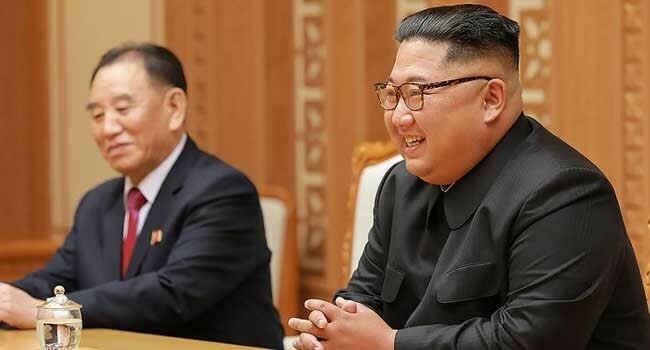 Kim Jong Un also “expressed an intention to meet with Moon frequently in 2019” to pursue peace and “solve the issue of denuclearising the peninsula together,” the spokesman said. The official did not elaborate on how the letter was delivered. Moon welcomed the latest message, saying Kim had also expressed “active intention to carry out agreements” made in his previous summits with the US and the South, without elaborating further. “I welcome chairman Kim’s intention to solve together the issue of denuclearisation…by meeting frequently even next year,” Moon said in a statement. The two neighbours technically remain at war after the 1950-53 Korean War ended with a ceasefire instead of a peace treaty. Moon — a dovish former human rights lawyer — has advocated dialogue to push the impoverished but nuclear-armed North toward denuclearisation. Cross-border ties improved markedly in 2018 as Kim made a series of reconciliatory gestures — including a historic summit with US President Donald Trump in June in Singapore. But progress in pushing the North to give up its atomic arsenal has stalled as Washington and Pyongyang accuse each other of dragging their feet and acting in bad faith. Critics say North Korea has made no concrete commitments and is unlikely to surrender its nuclear weapons, while Washington’s policy of maintaining pressure through isolation and sanctions has left Pyongyang seething. Trump said last week that he was “looking forward” to his second summit with Kim, which the US says may take place early next year.